This apartment is located in the Prague centre, just 15 minutes from the majestic old town district, in a pleasant residential area. The interior was designed with a lot of care and good taste. Its a warm, light and comfortable place. The apartment consists of a spacious bedroom with double bed and a living room with sofa bed, dining table and 40 flat-screen TV. Guests can prepare meals in the modern fully equipped kitchen. The bathroom features a walk-in shower. 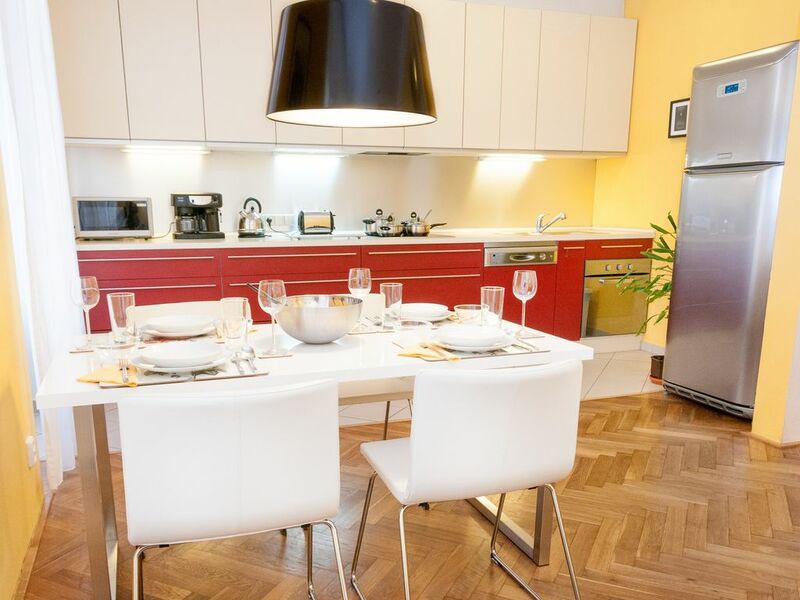 Fully equipped, great for a vacation or business stay in a favourite Prague neighbourhood. Shops, restaurants, bars and cafes can all be found within 5 min walk of the apartment. Pragues National Gallery is located just 2 min walk away. Stromovka Park is 10 min away and the beautiful old town district is 25 minutes away on foot. Vltavsk Metro Station and Praha Bubny Train Station are both located within 5 min walk of the apartment. Pragues majestic castle is a 20-min journey away using the Metro, the citys iconic astronomical clock can be reached in 15 min. Its excellent place for a single person, a couple or up to 4 people and especially for those who care about the style, who enjoy well designed living space. Travellers who love cooking will find this apartment a perfect choice for a spacious kitchen and all equipment needed for daily cooking. Its ideal place for families with a baby. Plates, glasses, cookery accessories are all supplied! Apartment is located in the popular residential area in the city centre, in the brick-built residential building with windows facing garden on one side, and quiet street on the other side. Streets with shops, pubs and restaurants are typical for this area that is a favourite place for living. Prices are considerably lower here than they are in of the Old town. Famous Prague Zoo is close, situated on the other side of the Stromovka park. Parking is possible on a 24h-protected parking place right in front of the apartment for 8/day or 20/week. You can also park your car on the streets on few marked parking places (with parking meter) between 8:00 to 18:00 and for free over night (18h - 8h) and weekends. However these places are often occupied based on the rule first come, first served. We had a very warm welcome from Marketa on arrival. The apartment is very clean, comfortably furnished, with a well equipped kitchen and a large storage area for clothes and bags. We slept well in the comfortable bed and the area was quiet at night. There is a supermarket (Albert) within 5 minutes walk which had a good selection of produce for self-catering and the tram stop is also close by with a regular service into the centre of Prague. We were able to park our car safely in the car park opposite the apartment (600 Koruna for a week). The apartment is very comfortable and we would be very happy to stay in it again. Es stimmte alles ganz gut. Es kann etwas besser geputzt werden. Sonst alles da was man so braucht. We stayed here with our 3 and 5 year old girls. Apartment was very clean and it even has a washing machine which made our lives much easier. The place seem much more opened and bigger than the pictures convey. It is about 3 blocks from public transportation and a market. We will stay here again when returning and will recommend to our friends. Clean, spacious, conveniently located. Recommend highly. This lovely apartment was truly a home away from home. It was exactly as pictured — clean, modern, and equipped with everything you might need for a short or long stay. My husband and I had an extended stay here for work reasons. For us the location was ideal: an authentic, up-and-coming neighborhood away from the crowded tourist center yet still offering numerous amenities such as restaurants, drugstores, grocery stores, banks, etc. Public transit is very convenient, with multiple tram lines traversing the nearby Strossmayerovo square and also the Vltavská metro/tram stop only a short walk away. (In December, the brightly lit Christmas tree and the mulled-wine stand in front of the nearby Antonínova church lent an extra touch of cheer.) Tram #17 provides an easy and short ride to Old Town Square, the National Theater, etc. It's also an easy and pleasant 15-20 minute walk from the apartment to Namesti Republicky, Old Town Square, the Jewish Quarter, and other sites. If you're up for a longer walk, you can even go through Letná Park en route to the castle area. Bubenská street itself might appear a little sketchy, with abundant graffiti defacing some of the buildings, but we felt quite safe. Marketa was very responsive to emails during the reservation process and was friendly and helpful once we arrived. The apartment was cozy and warm even on wintry days, and cooking in the spacious kitchen was a pleasure. Wi-fi was reliable and fast. We have fond memories of our time in this apartment and recommend it highly.